Ushering the new 4K version of Phantasm (1979) is a new poster to go along with the upcoming 4K remastered version of Phantasm. Original director Don Coscarelli partnered up with J.J. Abrams" Bad Robot to create a full 4K restoration. 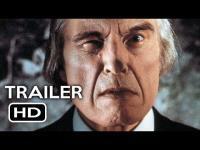 This 4K Phantasm film will release in movie theaters on September 24, 2016 and then VOD on October 7, 2016. This poster is also new to follow with the restored theme. The poster does an excellent job of delivering the new aspect while still staying true to the classic feel. Mike, a young teenage boy who has just lost his parents, afraid to lose his brother follow him to a funeral, where Mike witnesses the Tall Man lifting a coffin on his own. Mike decides to investigate, and discovers that the Tall Man, protected by his flying spheres, is shrinking dead bodies down to half their normal size and reanimating them as slaves. It is then up to Mike, his brother, and Reggie the ice cream man to stop the Tall man.